Capacities 20,000 lb. to 200,000 lb. The load cell is designed to fit into the lift yoke at the point where the grapple is attached. Scrap is weighed in motion as it is loaded. 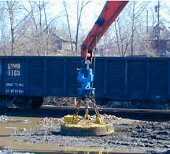 The System can be used on either hydraulic or a cable system that utilizes either a grapple or a magnet. The design is perfect for scrap handling, allowing your crane operator to get precise weight information instantly. The scale can be complimented with several instrumentation packages that are available through Technical Weighing Services, Scrap Management Systems. The Lift Yoke assembly is modified to accommodate load cell and tested at the factory. The unit will match the existing equipment and operate without any mechanical binds.